Weekend Buffet Lunch For Rs. 225 Only is an event that took place between 28-Apr-2007 and 29-Apr-2007 in Hyderabad. Spending the weekend chopping humdrum veggies and ladling dull dal are banned activities. Pride Of Hyderabad, situated on the first floor of Anmol Continental, offers a handy solution. The weekend lunch buffet promises savoury food for a modest Rs. 225. You can treat yourself to some royal ghost paya shorba,  kacchi ghost ki biryani  and zesty  achari murg. Or else just stroll across to the pasta counter. The chef makes a special effort to keep vegetarians happy. 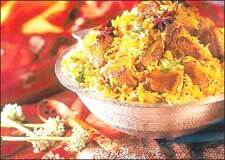 There is sabzi ustad ki pasand, consisting of culinary curry delights, picked for the day, by the chef. So expect anything from dumki paneer  to  sabzi mastana. You even get complimentary soft drinks. Meethe mein kya hai ? The list of sweets runs into pages. Fresh fruit salad for the calorie-conscious, kadoo halwa, gajar halwa and khurbani for those who dismiss all calorie fundas. And if you thought innovation in the kitchen is non-existent, think again. Delicious puddings exclusive to this restaurant are ginger ka halwa and garlic kheer. So go all out and hog like you've never hogged. Please contact 6684-8904 for further details. Be the first to comment on Weekend Buffet Lunch For Rs. 225 Only! Just use the simple form below. fullhyd.com has 700,000+ monthly visits. Tell Hyderabad what you feel about Weekend Buffet Lunch For Rs. 225 Only!